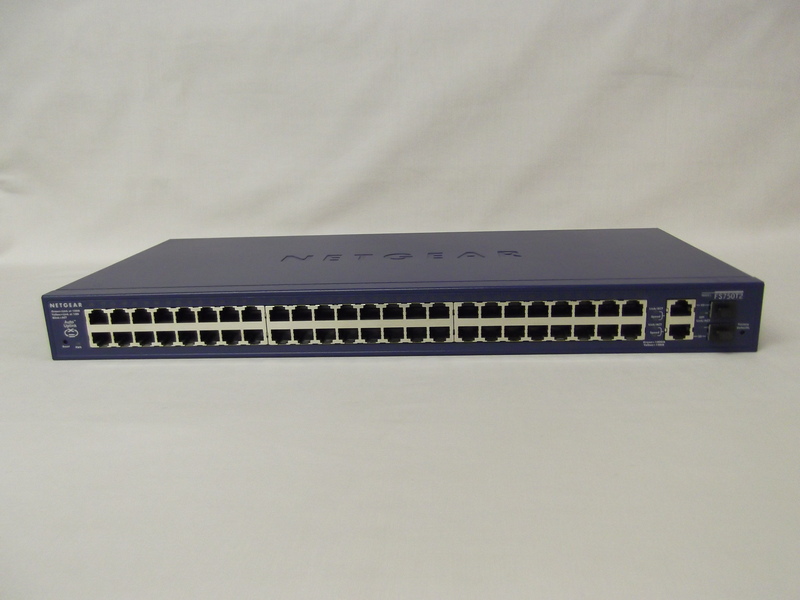 NETGEAR has packed a lot of value into this high density switch. Start with high port density in a one unit box, add two gigabit uplinks to give an added edge to any growing business, then add key switch management capabilities and you have a powerful switch that costs a lot less than you’d expect. Forty-eight 10/100 Mbps ports and two copper Gigabit Ethernet ports connect to servers or a Gigabit-speed backbone for a non-stop, always available 10/100/1000-enabled network that can quickly deliver large multimedia, image, and video files. All 50 shielded RJ-45 ports automatically negotiate to the highest speed and support Auto Uplink™ technology to make the right link. Two hot-swappable Small Form-factor Pluggable (SFP)** GBIC slots provide optional fiber connectivity for greater distance. In addition, an intuitive, Web-browser interface offers the simple Smart Switch management, making it a snap to monitor switch performance, configure ports, even set up port trunks, VLANs, and traffic prioritization. Alternatively, use SNMP-based software to manage your Smart Switch. Shipped ready for use straight out of the box, it delivers switching that’s easy to set up and use. NETGEAR ProSafe Smart Switches are ideal for adding basic management to your unmanaged networks and extending your managed networks.